(Nanowerk News) Recent advances in robotics technology make it possible to create prosthetics that can duplicate the natural movement of human legs. This capability promises to dramatically improve the mobility of lower-limb amputees, allowing them to negotiate stairs and slopes and uneven ground, significantly reducing their risk of falling as well as reducing stress on the rest of their bodies. That is the view of Michael Goldfarb, the H. Fort Flowers Professor of Mechanical Engineering, and his colleagues at Vanderbilt University’s Center for Intelligent Mechatronics expressed in a perspective’s article in the Nov. 6 issue of the journal Science Translational Medicine ("Realizing the Promise of Robotic Leg Prostheses "). An early version of the lower limb prosthetic designed by the Center for Intelligent Mechatronics. Unlike passive artificial legs, robotic legs have the capability of moving independently and out of sync with its users movements. So the development of a system that integrates the movement of the prosthesis with the movement of the user is “substantially more important with a robotic leg,” according to the authors. Identifying the user’s intent requires some connection with the central nervous system. Currently, there are several different approaches to establishing this connection that vary greatly in invasiveness. The least invasive method uses physical sensors that divine the user’s intent from his or her body language. Another method – the electromyography interface – uses electrodes implanted into the user’s leg muscles. The most invasive techniques involve implanting electrodes directly into a patient’s peripheral nerves or directly into his or her brain. The jury is still out on which of these approaches will prove to be best. “Approaches that entail a greater degree of invasiveness must obviously justify the invasiveness with substantial functional advantage…,” the article states. Studies have shown that users equipped with the lower-limb prostheses with powered knee and heel joints naturally walk faster with decreased hip effort while expending less energy than when they are using passive prostheses. In addition, amputees using conventional artificial legs experience falls that lead to hospitalization at a higher rate than elderly living in institutions. The rate is actually highest among younger amputees, presumably because they are less likely to limit their activities and terrain. There are several reasons why a robotic prosthesis should decrease the rate of falls: Users don’t have to compensate for deficiencies in its movement like they do for passive legs because it moves like a natural leg. Both walking and standing, it can compensate better for uneven ground. 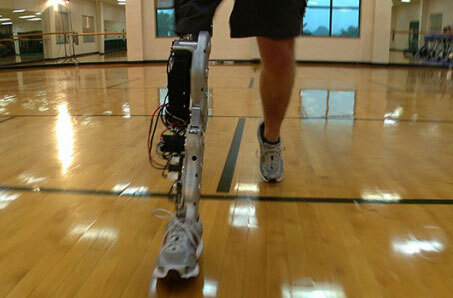 Active responses can be programmed into the robotic leg that helps users recover from stumbles. Before individuals in the U.S. can begin realizing these benefits, however, the new devices must be approved by the U.S. Food and Drug Administration (FDA). Single-joint devices are currently considered to be Class I medical devices, so they are subject to the least amount of regulatory control. Currently, transfemoral prostheses are generally constructed by combining two, single-joint prostheses. As a result, they have also been considered Class I devices. In robotic legs the knee and ankle joints are electronically linked. According to the FDA that makes them multi-joint devices, which are considered Class II medical devices. This means that they must meet a number of additional regulatory requirements, including the development of performance standards, post-market surveillance, establishing patient registries and special labeling requirements. Another translational issue that must be resolved before robotic prostheses can become viable products is the need to provide additional training for the clinicians who prescribe prostheses. Because the new devices are substantially more complex than standard prostheses, the clinicians will need additional training in robotics, the authors point out. In addition to the robotics leg, Goldfarb’s Center for Intelligent Mechatronics has developed an advanced exoskeleton that allows paraplegics to stand up and walk, which led Popular Mechanics magazine to name him as one of the 10 innovators who changed the world in 2013, and a robotic hand with a dexterity that approaches that of the human hand.